Find this beautiful White/Rose Gold Diamond Engagement Ring at Raymond Lee Jewelers in Boca Raton — Palm Beach County’s destination for engagement rings, men’s wedding bands, wedding bands for women and diamond rings. Mounting Diamond Details Approximately 0.40ctw of Round Brilliant Diamonds, G in color and VS in clarity. Approximately 0.21ctw of Pink Round Brilliant Diamonds. Additional Details This Item Comes with a Raymond Lee Jewelers Presentation Box and GIA color certificate! Categories: Diamond Engagement Rings, Diamond Jewelry, Diamond Rings, Diamonds, Engagement & Wedding | Raymond Lee Jewelers, Gold, Jewelry, Pear Shaped Engagement Rings, Rings, White Gold, with Diamonds. 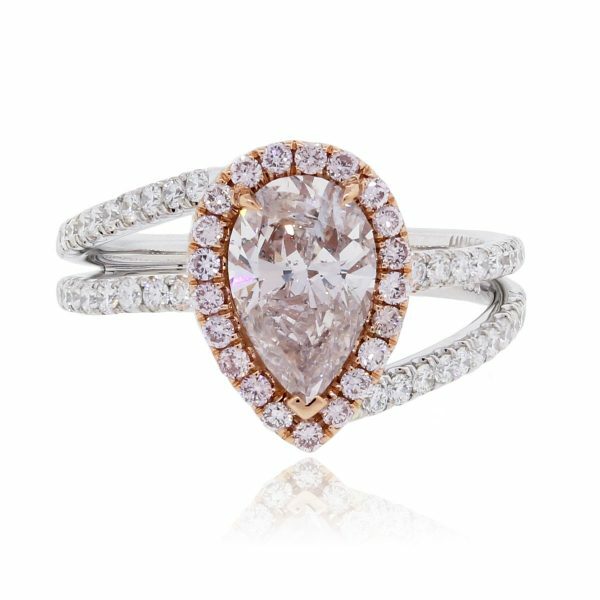 Tags: 18k White and Rose Diamond Ring, Diamond Engagement Ring, Engagement Ring, pink pear shape diamond ring, White and Rose Gold Engagement Ring.